Plan, make sure you plan weeks in advance. You can never be too prepared believe me. Go through each room and list what you have, what you want to get rid of etc. Have you contacted your bank, other companies and your favourite on line stores to let them know your new address? There's nothing worse than ordering something and having it delivered to your old address. Declutter, moving is the perfect opportunity to declutter your home. Not only will you be making space in your new home, you could also make some much needed money by selling the items you no longer need. Arrange Childcare, your little ones are more than likely going to be excited about moving. I know Darcy couldn't wait to see her new bedroom. However having them under your feet can slow down the moving process. So make arrangements well in advance, then pick them up afterwards for the exciting trip to their new home. Label your boxes, There's nothing worse than trying to look for something and not knowing where it is. You don't want to be opening box after box looking for a can opener. 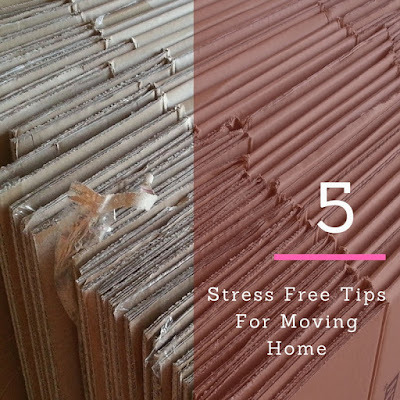 Also, consider placing the things that you use daily into separate boxes, that way you will have an easy access at them when you are into your new home and you won’t have to guess in what box they are. Hire a Removal Company, do you really want to be carrying boxes all day long? As frugal as I am, I knew hiring a removal company would be the best option for me. Thankfully there are companies out there like Shiply. Their site is super easy to use, You make a listing on the site about what you require for your removal this will include, your address, number of bedrooms, items you want moving and once you've received some quotes, you decide which one you'd like to accept. Shiply works like eBay where you can read the transports company’s feedback from previous customers and compare it to give you a clear idea of the type of service you could get. What handy tips do you have to make moving stress free?